love your style! would you mind sharing what tile this is? - Love the tile! 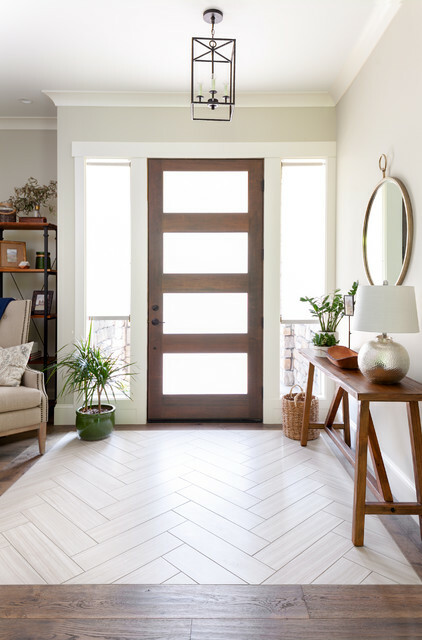 Struggling with finding a tile that is modern farmhouse and this is perfect. The outer border is hardwood flooring, used throughout the main floor. What colour grout was used with this tile? sizes of base and crown mouldings - Do you mind sharing sizes of the door casings, baseboard and crown moulding? Is that an 8-ft door? TIA. Do you know the ceiling height and the height of the door by any chance? TIA. I don't have those dimensions. I think that is an 8'0" door though, if that helps. sidelights - What are the side light window coverings? Those are roller shades with a sun-filtering fabric (solar shades). How are the mounted? Curios since it’s such a small space. I think that was a Sherwin Williams color called "Rice Grain." are the sidelights from the door company or are they windows? Can you tell me more about the tile? - What size is the tile? Any other details like where you found it, color, etc would be helpful too! TIA! I know it was from Daltile and is a porcelain plank tile, made to simulate the look of vein-cut travertine. I don't recall the style name. What stain color did you use on the door? I'm sorry, I don't have that information. Love the light fixture, where did you get it from? Ballard Designs: Hadley 4-light fixture. You can find similar doors on the Simpson Door website. Love the mirror...Where is that from? I don't know for sure, but it might have come from HomeGoods. flooring - What is the hardwood floor? Do you know the brand, color and name of it? love it!